SummerSlam 2014 got underway with a surprise appearance from the immortal Hulk Hogan. Nothing all that exciting about his appearance though, he was basically there to sell the WWE Network. I understand that the WWE have a product to sell, but I do find the way they advertise it to be cringeworthy most of the time. Decent match to kick off SummerSlam and the first of three title changes during the evening. After some nice exchanges in a fast-paced match, Ziggler picked up the win with the Zigg-Zag. For me, this was a surprise title change. But at the same time Ziggler is so over with the WWE Universe that it can't really go wrong! Who knows what's next for The Miz - Are they doing a new Marine movie? Second title match of the evening and the second title change. Again, for me this was a surprise title change, but an enjoyable one. Paige's recent heel turn added some spice to the rivalry in the build up to this match. But in the end she won clean to regain the Divas title. Where this rivalry goes from here, who knows? Maybe AJ will win the title back tonight on RAW! The Divas belt is seemingly becoming a hot potato between the two of them, so why not!? We never thought for one second that Rusev's winning run would be broken at SummerSlam by Jack Swagger. 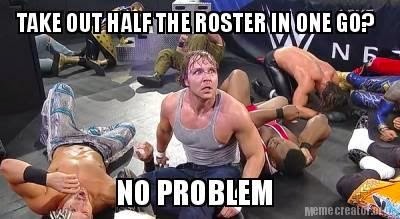 It is clear that WWE are lining him up for a push and have been for some time. That said, this was his biggest test to date and for once he had take part in a fairly even match where he had to sell and take bumps. Swagger got Rusev in the Patriot Lock before the match had even started and so the Bulgarian Brute had to nurse his ankle through the entire contest - Which he sold well and convincingly. Rusev's ankle made it difficult for him to put Swagger in his finishing hold 'The Accolade', but once he finally did (fighting through the pain barrier) Jack Swagger eventually passed out. Rusev wins - But Swagger didn't tap. We've got a feeling this one may rumble on. This was easily the match of the night and given all the hype and build-up it certainly delivered. I think we all groaned a bit when Ambrose chose a Lumberjack Match for his stipulation, but last night the groaning stopped. The lumberjacks all played their part and there was some brilliant brawling through the crowd between the two former 'brothers'. The best high spot of the night went to Ambrose who dived onto the lumberjacks carrying Rollins back to the ring. In one motion he took out half of the WWE roster - Incredible! Rollins was always going to win this one and always going to win unclean and so that proved to be the case, with a little bit of help from Kane and his MITB briefcase! The good news is that this feud is FAR from over and we've got a feeling Ambrose will get his revenge. We haven't really been won over by this feud. Y2J was brought back to the WWE specifically to feud with Wyatt and to get him over even more. Not sure it's been entirely successful and Wyatt was certainly getting over more during his feud with John Cena. Not to mention that the Cena/Wyatt matches were better in general. Wyatt was always going to win this one after losing to Jericho at Battleground and so that proved to be the case, with Jericho putting him over clean as well. With the scores now at 1-1 will we get a decider next month? Maybe we will. Either way I'm not sure the WWE Universe are sold on this feud and it will be interesting to see what happens after, particularly for Wyatt. The spoilers did what they do best and spoiled the ending to this one weeks ago. It was practically common knowledge that Nikki Bella was going to turn on her sister Brie and I found myself just waiting for it to happen. This distracted from the match somewhat, which wasn't actually all that bad! Most impressive was the in-ring prowess of Steph. With the crowd chanting "You've still got it" throughout the match. Steph picked up the win with a LOT of help from her husband and Nikki Bella. We fully expect this one to rumble on for a while to come. Roman Reigns is the golden boy, make no mistake about it. He is being primed to become a WWE champion in the not to distant future. Which is exactly why he was always going to go over against the Apex Predator, Randy Orton. In all honesty, I'd completely forgotten about this match on the card! What with all the excitement that went before it, I was just waiting for the main event between Cena and Lesnar. The match itself was neat and tidy without ever really setting the world alight. It would've been nice to have seen Orton in the mood he was in a few weeks ago on RAW when he destroyed Reigns. The most impressive spot was Reigns launching into his trademark 'Superman Punch', only to be caught by a mid-air RKO - This led directly to the best near-fall of the night. Reigns eventually picked up the win with a Spear, and his WWE mega-push continues. I do worry for him slightly for a few reasons. Mainly that he is still a little bit green and rough around the edges in my opinion. It does feel a bit like his push is as a direct result of his stature and looks. But more importantly I worry for his sequence of trademark moves becoming too predictable and repetitive. I think it could end up being as boring as Cena building up to his 'Five-Knuckle Shuffle' and we all know what kind of response that gets! Was I the only one who heard a few moans and groans directed at Reigns last night? If so, that doesn't bode well. We all thought that Lesnar might win this one - But I don't think ANYONE could have predicted the manner in which he won the belts. In short, Cena was annihilated by Lesnar. I would go as far as to say that this was just an extended squash match. 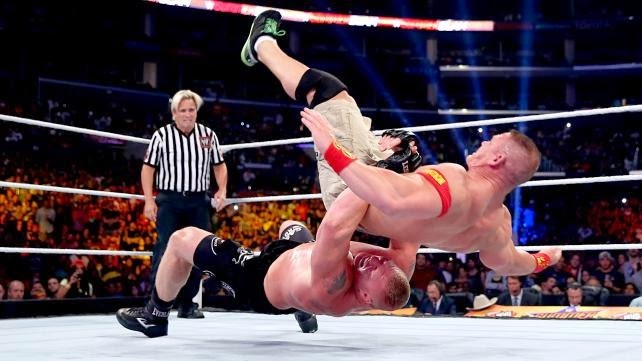 Cena received SIXTEEN brutal suplexes and two F5's before losing clean to the Beast. With Cena losing in this manner it does make you wonder - Is he off for a break? Or is the unthinkable about to happen? Is he about to turn heel? I mean, how DO you come back from a main event defeat like that? 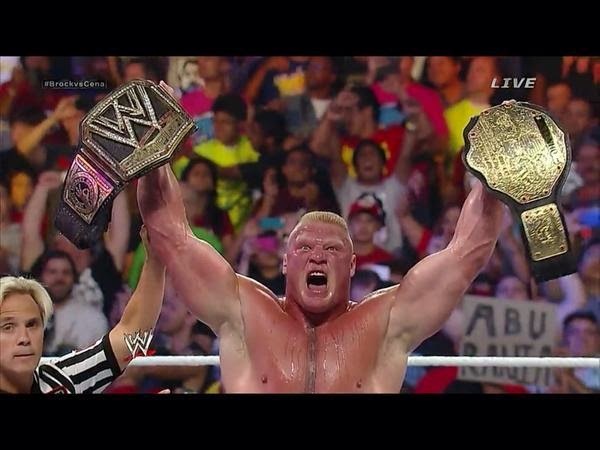 For Lesnar, this sets him up for a long run as WWE champion. He looked every bit 'The Beast' last night and it does pose the question - Who could realistically beat him? Time will tell, but one thing is for sure - Get used to seeing those two golden belts a lot less on the TV - We now have a part-time World Champ.